Two recent reports that track K-12 spending reveal schools’ strong interest in purchasing security-related hardware, products, and technology. In one of those analyses, researchers found that “public safety” was the fastest growing category of formal solicitations for education spending in the 3rd quarter of 2016, compared to the 2nd quarter. The findings are included in Onvia’s “State and Local Procurement Snapshot Q3 2016” report, which tracks requests for proposals and bids. Districts’ demands could include “gun detectors when you walk into a school, security guards or patrol officers who hang out at schools, or the equipment [schools] buy like security cameras,” said Paul Irby, the lead market analyst who wrote the report, in a phone interview. 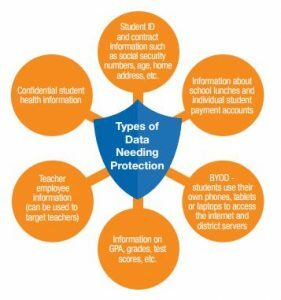 And according to a second analysis, cybersecurity was the focus of 2,600 bids and RFPs put out by schools and districts, of which 96 percent were tied to funding from the federal E-rate program over the past 12 months. Most are bids that fall into the “services” category, rather than being designated as software, according to researchers from Onvia, in a report released in December. The E-rate program, overseen by the Federal Communications Commission, subsidizes schools’ and libraries’ use of broadband through funds collected as fees for telecommunications services. Onvia’s research on the districts’ demands for online protection was included in a report titled, “The Rise of Cyber Security: How Governments are Buying and What it Means for Vendors.” Analysts discovered that “many E-rate cybersecurity awards tend to be fairly small in dollar value, as a minor component of a larger IT district project,” the report indicated. Onvia, a company that tracks and reports on the spending of federal, state, and local government agencies, also found that 10 percent of all the cyber bids and RFPs that were not tied to the E-rate were issued by a school district, rather than some other level of government—typically state agencies. As for growth in other general categories for solicitations in the 3rd quarter, the second-most frequently identified area was “professional business services,” which would include services and consulting in areas such as administration, employment, legal, professional, business and publishing. The third largest spending is for transportation, which Irby said usually means spending on buses in education. For the education sector, the industry growth ranking was based on seasonally adjusted growth in bids and RFPs from the 2nd to the 3rd quarters of 2016.